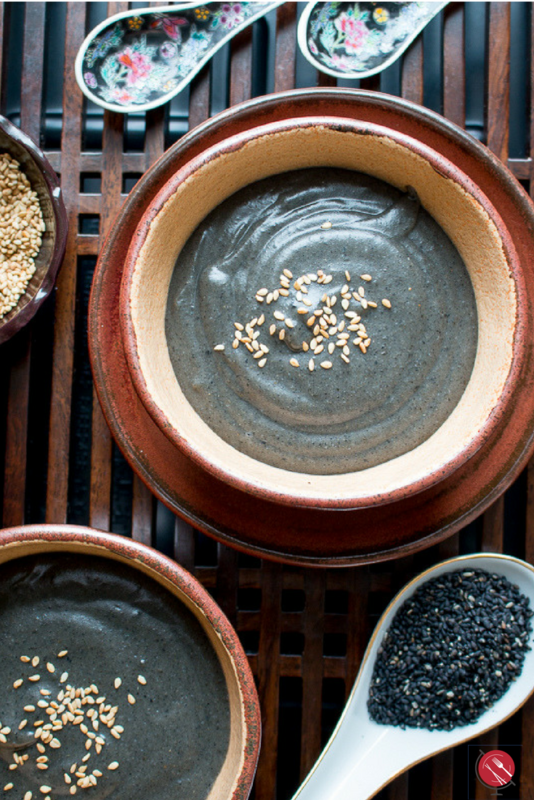 Hot Black Sesame Cereal is the homemade lightened up version of the simply delicious and nutritious toasted black sesame seed hot cereal (tong sui/sweet dessert soup). If you have never tried Hot black sesame cereal then this is going to be a real game changer for you. 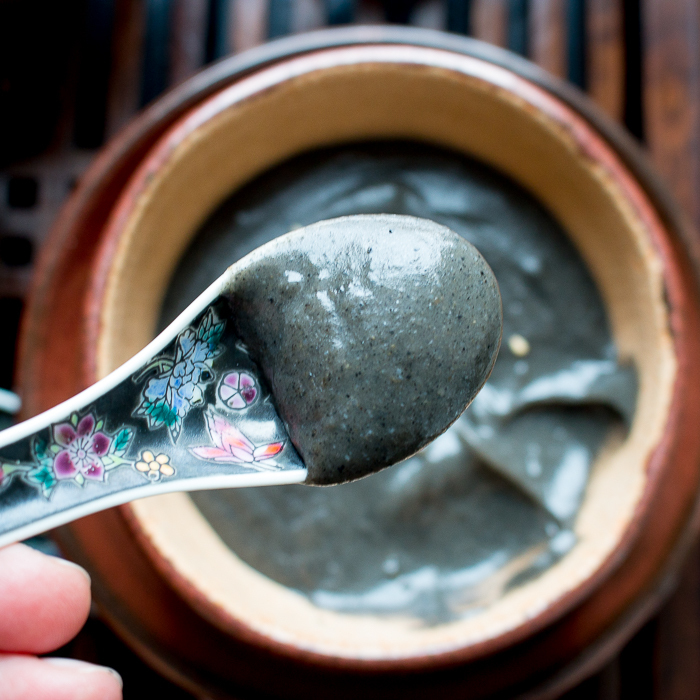 Hot black sesame cereal is thick, rich, creamy, nutty and simply delicious. We sometimes refer to this dish as a cereal as it can be eaten for breakfast but it can also be eaten as a dessert. In Hong Kong, China, Singapore, Taiwan, etc. they may refer to this as “Tong sui” which literally means "sweet water" but it's really any sweet warm, custard like soup served at the end of a Cantonese style meal. This soup might catch you off guard, if you have never eaten toasty warm dessert soup before. Try new things. Be adventurous! If you like nutty delicious sesame seeds, you are really going to enjoy this recipe. Hot Black Sesame Cereal is a great cereal/dessert to enjoy during the cooler weather or with changing weather seasons. Our bodies are craving the warmth and nutrients. 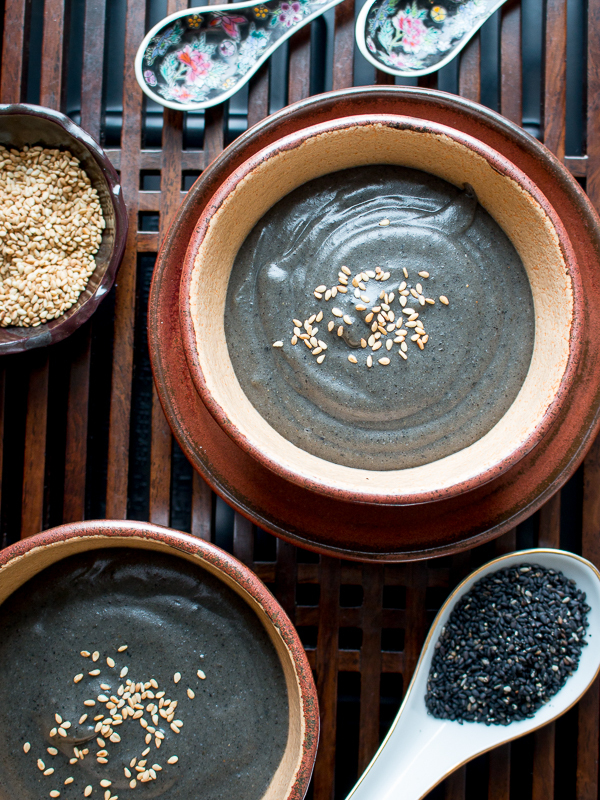 Black sesame seeds have many health benefits. 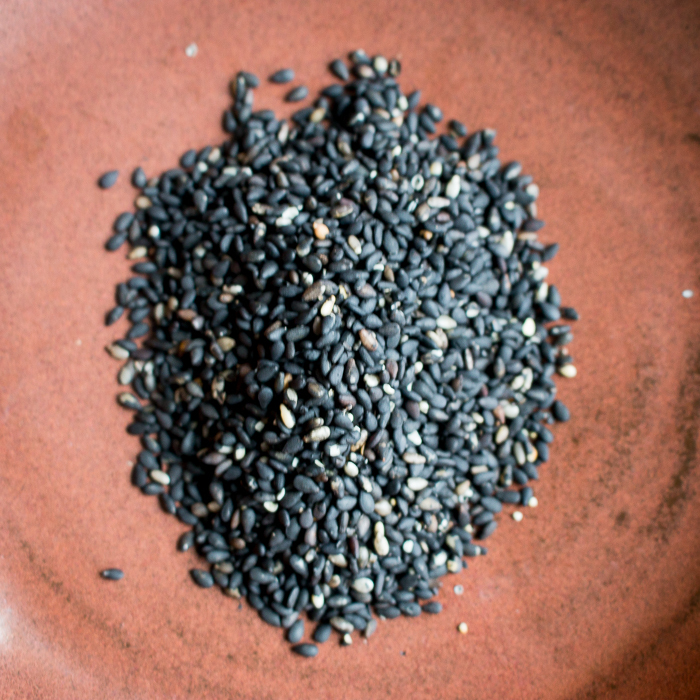 One serving of our Homemade Hot Black Sesame Cereal has about 2 tablespoons of sesame seeds. Approximately 6 grams of iron to help with anemia. Traditional Chinese medicinal (TCM) practices use sesame to warm the body, replenish blood, resolve constipation and nourish hair. Okay boys, head on down to the next paragraph as this next paragraph is for us girls! To ward off Premenstrual (PMS) symptoms, sesame seeds are packed with iron to boost your body before blood loss, vitamin B6 and Magnesium to keep your mood even. 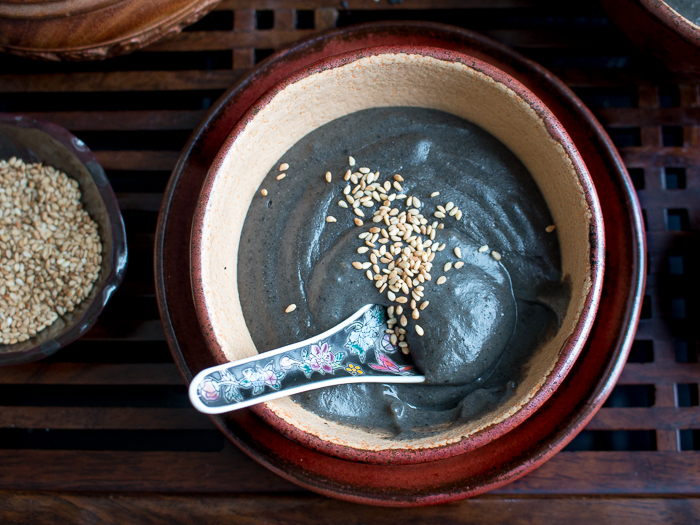 If you have a slight sweet craving before your menses, then Hot Black Sesame Cereal is the perfect solution. 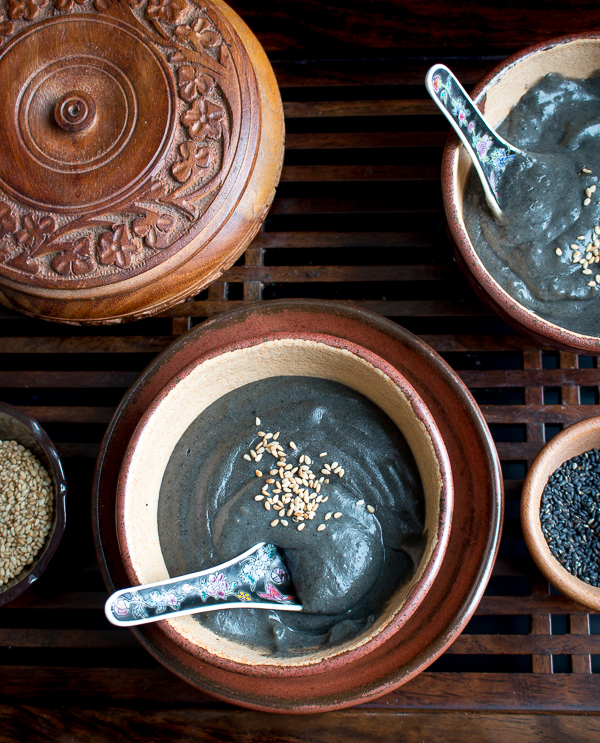 In addition, black sesame seeds help lubricate and help prevent constipation. We all know that can be a problem around your period. 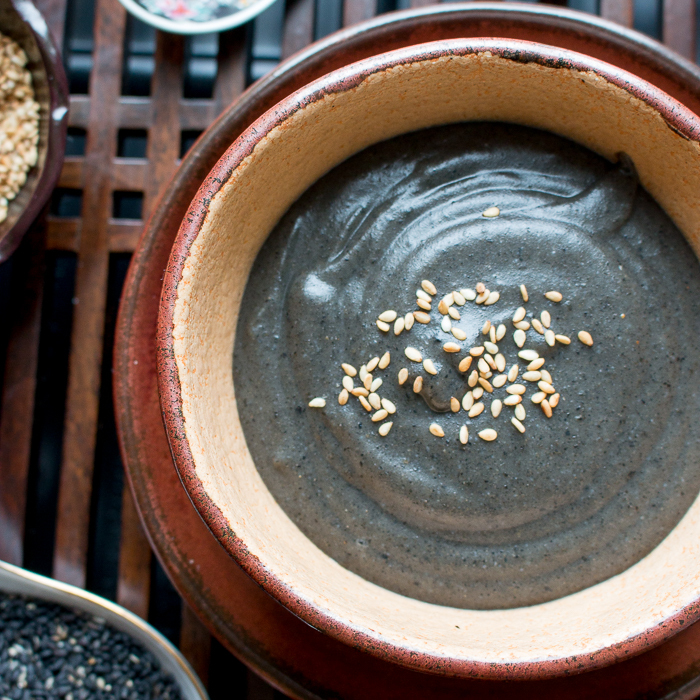 Hot Black Sesame Cereal is slightly sweet and neutral to help balance the body. If you are looking for a great way to naturally conquer PMS, be sure to check out our recipe for Women's Health Soup. If you want to revitalize after your period, please try our simple and delicious Goji Berries and Red Dates Herbal Tea. You can generally find convenient packets of the dried black sesame cereal in the local Asian grocery stores and all you need to do is add hot water. However, even their lower sugar version is far too sweet for our taste. We only like things delicately/naturally sweet and we do not like using processed granulated or rock sugar. We want to say a very special thank you to our dear friend Midco!!! She outfitted Healthy World Cuisine with at least a "Life Time" supply of toasted black sesame seeds and all kinds of goodies. We like making our own Hot Black Sesame Cereal from scratch so you can control how thick you like your soup and how sweet you like it. We used just a little drizzle of raw honey instead of granulated sugar to make it slightly sweet. If you want to make this recipe vegan, you can use maple syrup or just little sugar alternative of choice. If you want it only naturally sweet you can add Chinese red dates or goji berries to the cereal. You can buy your black sesame seeds already toasted or can do this in a dry pan for just a few minutes before grinding to a paste. You must use glutinous rice flour (sweet rice flour) for the cereal to thicken up. Regular rice flour will not make your soup thick but just a thin watery mess. Glutinous rice flour can be found in any good Asian market, whole foods store or even on amazon. Toasting your glutinous rice flour in a dry pan adds an extra nutty delicious flavor to the cereal. You can make extra dry black sesame rice cereal and store in a sealable container and then all you need to do is to add hot water and a little drizzle of honey/ or sweetener of choice before serving. We love to make extra plain toasted black sesame powder because it is delicious to add to your morning oatmeal, congee or even to your homemade rice noodles. We used a food processor to grind up our toasted black sesame seeds to a powder. If you do not have a food processor, you will certainly build some strong muscles doing this with a mortar and pestle. A little dash of salt to the black sesame cereal mixture makes the flavor really pop. As with any seeds or nuts you need to be cognizant of expiration dates of sesame seeds, as they can go rancid and they do have a shelf life. Raw sesame seeds need to be consumed within 6 months. However, if you toast your sesame seeds they can last up to a year. If you store them in the refrigerator or freezer they can last a little longer. 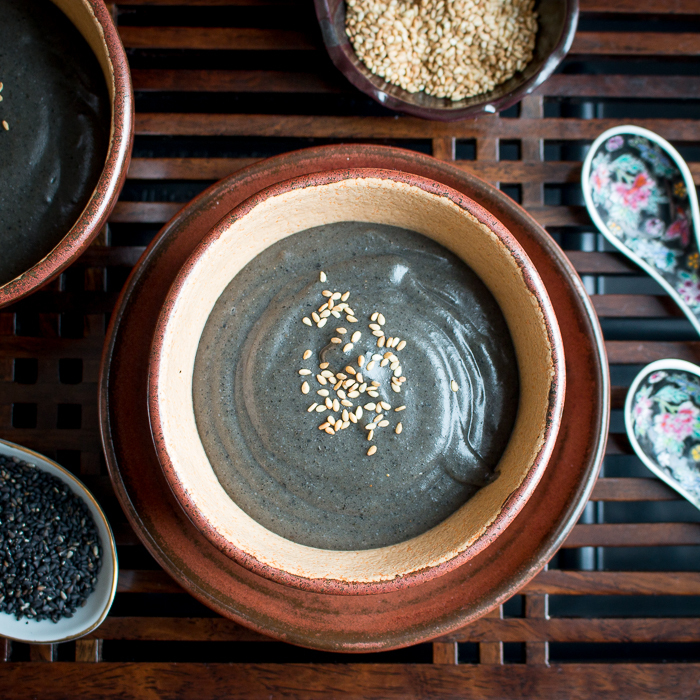 Hot Black Sesame Cereal is the homemade lightened up version of simply delicious and nutritious toasted black sesame seed hot cereal (tong sui/sweet dessert soup). Hot water – 4 tablespoons hot water or so for each 4 tablespoons of prepared dried black sesame cereal powder. 2Toast your glutinous rice flour in the same dry pan just until starts to get a little golden color and smells toasty. Set aside to cool. 3Place your toasted sesame seeds in the food processor and blend until a smooth powder. Add your toasted glutinous rice flour and salt and combine well. 4Place your dried prepared black sesame cereal powder in a sealed container. 5To enjoy one or more servings of Hot Black Sesame Cereal, Boil water in kettle. Place 4 tablespoons of prepared black sesame cereal in each bowl. Add one tablespoon at a time of water and stirring well to remove lumps. We like our cereal thick so we added 4 tablespoons of hot water for each 4 tablespoons of dried black sesame cereal powder. (Please note that the addition of honey will thin the soup out a little more) Taste and adjust your Hot Black Sesame Cereal for additional honey as required. If you like your cereal a little thinner, add more hot water. If you like your cereal a little thicker then add a little less hot water. Stir and enjoy!